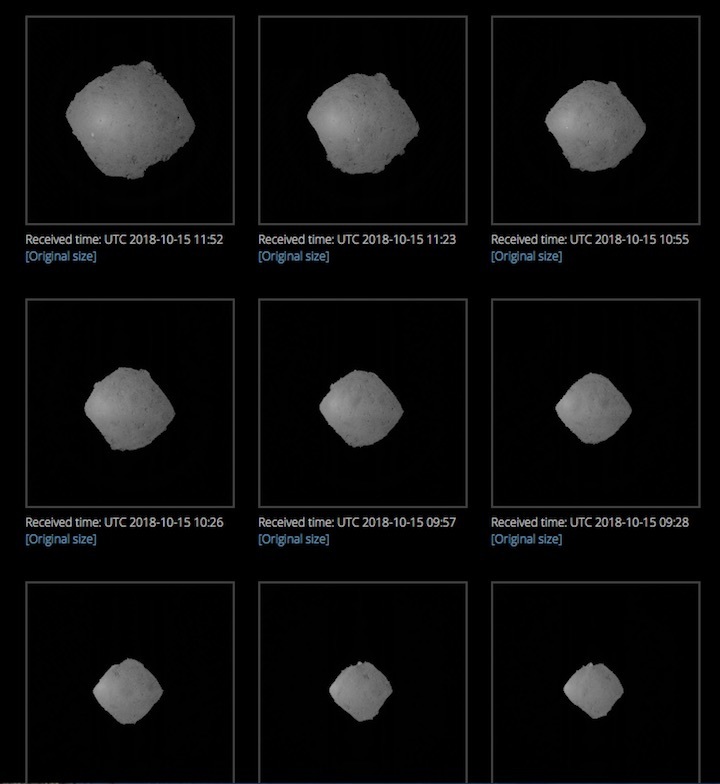 New photos taken on the surface of an asteroid show that it is (drum roll, please) ... rocky. 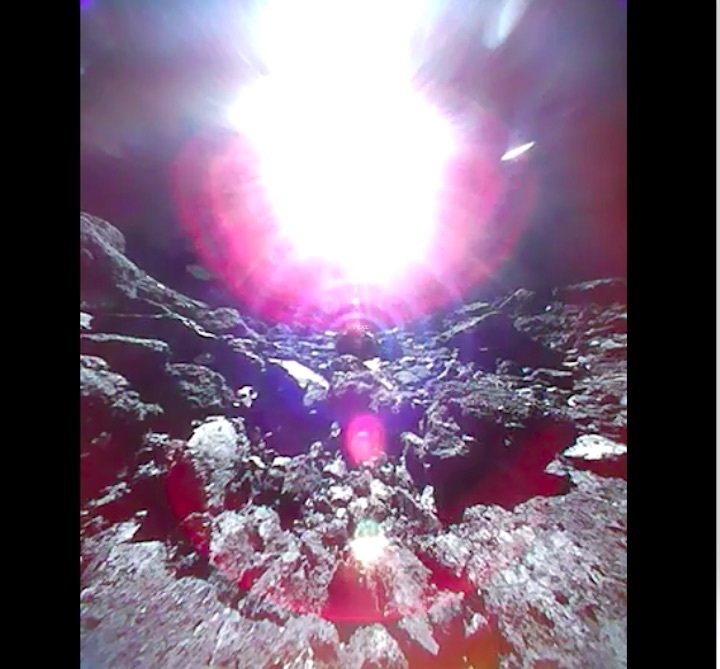 It may be no surprise, but Japan space agency scientists and engineers are thrilled by the images being sent to Earth by two jumping robotic rovers that they dropped onto an asteroid about 280 million kilometers (170 million miles) away. 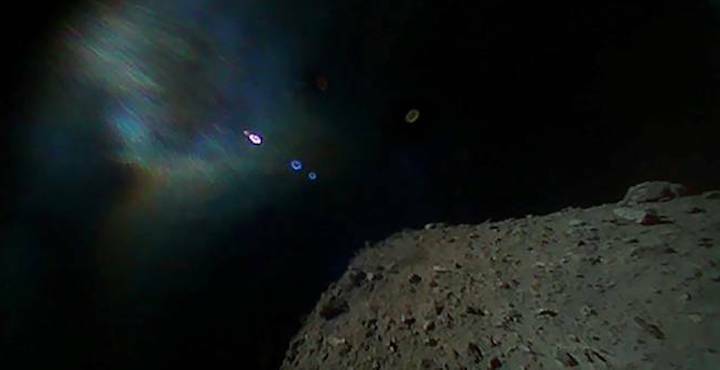 "I cannot find words to express how happy I am that we were able to realize mobile exploration on the surface of an asteroid," project manager Yuichi Tsuda said on the space agency's website. 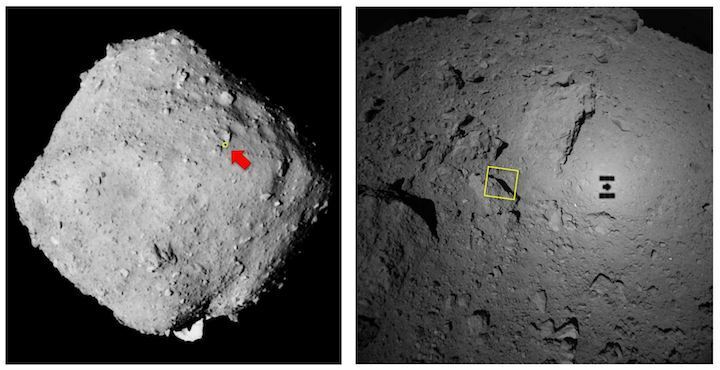 It took more than three years for the unmanned Hayabusa2 spacecraft to reach the vicinity of asteroid Ryugu. One week ago, the craft successfully dropped a small capsule with two rovers onto its surface. The rovers, each about the size of circular cookie tin, don't have wheels but jump around the asteroid. Japan's space agency (Jaxa) has released new images from the robot rovers it has deployed to the surface of an asteroid. 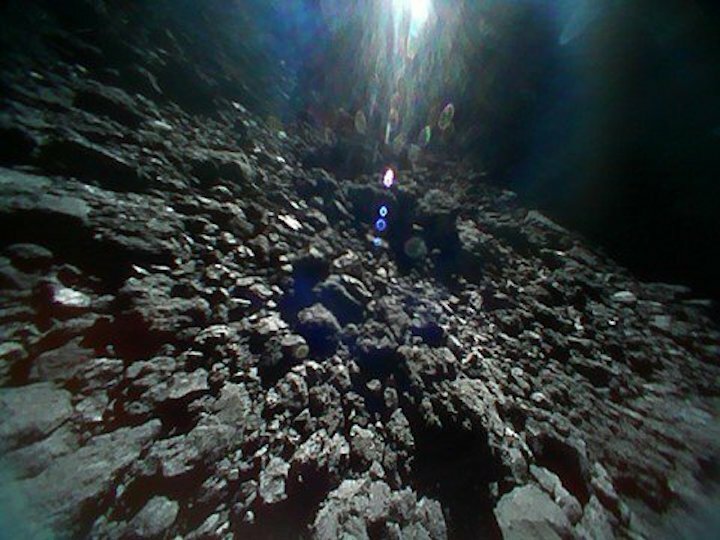 On 21 September, the rovers were released on to the surface by the "mothership", Hayabusa 2. The 1kg autonomous rovers move about by hopping, using the asteroid's low gravity. Each one contains a motor-powered internal mass that rotates to generate force, propelling the robot across the surface. On Friday, Hayabusa 2 descended to about 60m in order to release the rovers, which had been stored in a container on the base of the spacecraft. The 900m-wide space rock known formally as 162173 Ryugu belongs to a particularly primitive type of asteroid. It is thought to be a relic left over from the early days of our Solar System, so studying it could shed light on the origin and evolution of our own planet. 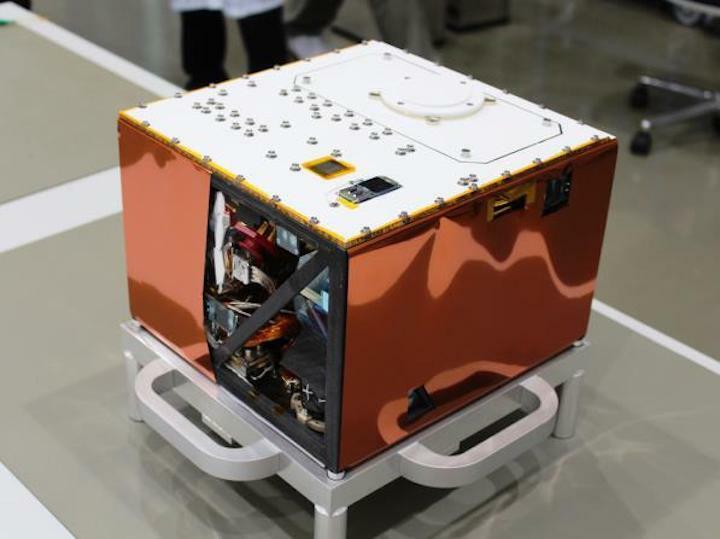 [MASCOT] During the MASCOT deployment operation, images taken for navigation with the Optical Navigation Camera - Wide angle (ONC-W1) will be replayed in real time. Come and see our gallery! Navigation Images from the MASCOT deployment operation (Sep. 30 - Oct. 4, 2018), taken by the wide-angle camera ONC-W1. 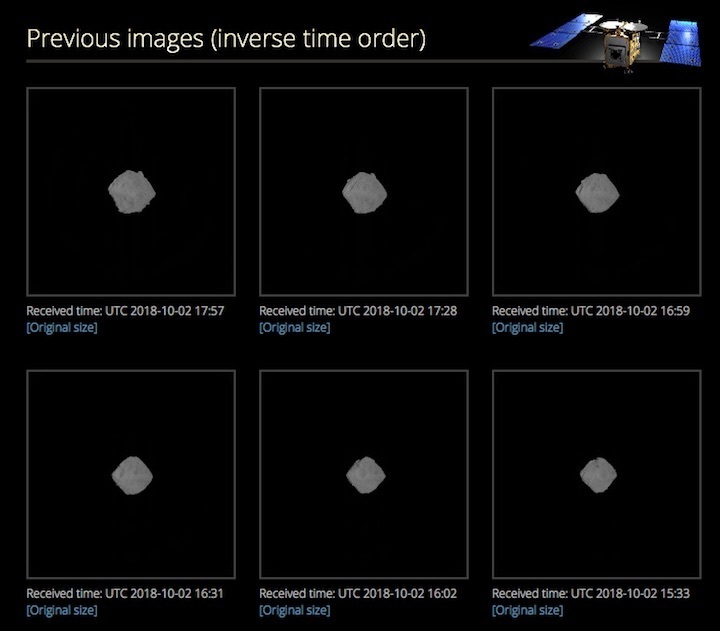 We are currently delivering navigation images with the Optical Navigation Camera Wide angle (ONC-W1) in real time. Please understand that the image may be distorted due to the network status or data processing. 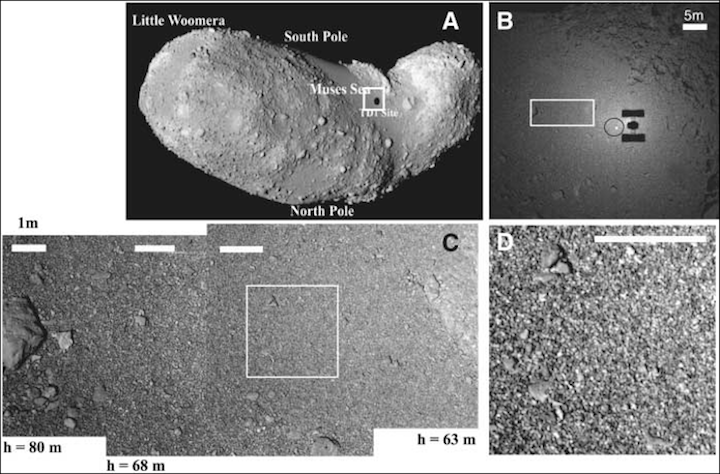 In these figures the south pole of the asteroid is at the image top. MASCOT] The schedule for the deployment of the @MASCOT2018 lander is now online. [MASCOT] October 3 at 03:05 JST: Hayabusa2 has descended to an altitude of about 2900m: we’ve passed 3km to the asteroid surface! It's sad that majority of the world's population will not realise just how incredible this is. MASCOT (Mobile Asteroid Surface Scout) is the asteroid lander jointly developed by DLR (German Aerospace Center) and CNES (French National Center for Space Studies). MASCOT is stored on the -Y-plane side of Hayabusa2 (this is the left-hand side surface when the high gain antenna is at the head and the ion engine is at the spacecraft back) and deployed from this position (see Figure 1). MASCOT has the shape of a cuboid with dimensions 0.3 x 0.3 x 0.2m. The lander weighs about 10kg, and is a bit larger and heavier than the MINERVA-II1 rovers (diameter: 18cm, height: 7cm, weight: 1.1kg). (Figure 2). 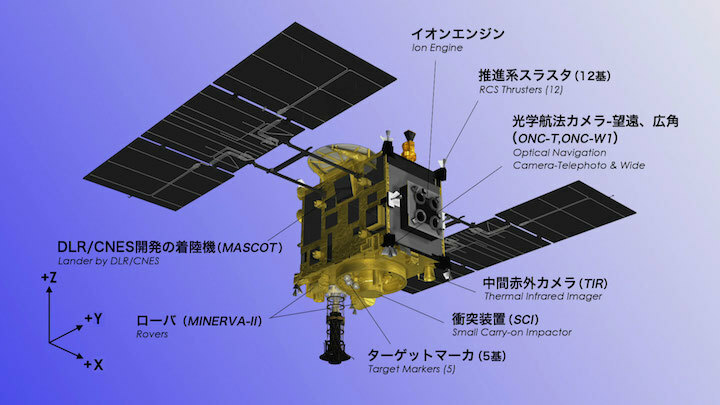 On the top side of MASCOT is an antenna to communicate with the repeater (OME-E) of Hayabusa2, as with MINERVA-II1. A wide-angle camera (MASCAM) is mounted on the side to capture images of the lander’s surrounding. 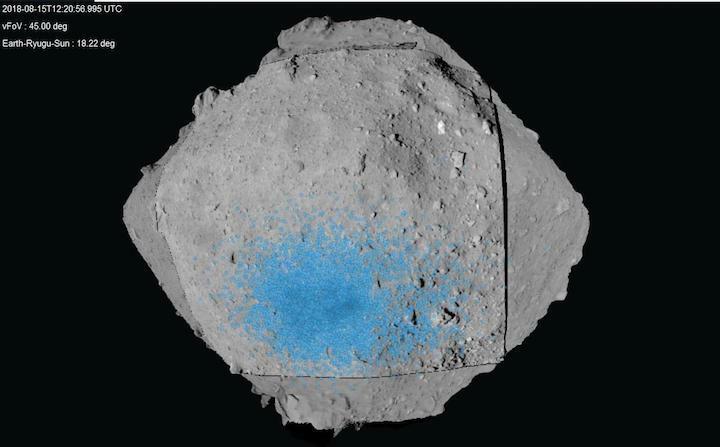 An infrared spectroscopic microscope (MircOmega) sits on the bottom surface of MASCOT to investigate the composition and characteristics of the minerals on the surface of Ryugu. There is also a thermal radiometer (MARA) to measure the surface temperature and a magnetometer (MasMag) to measure any magnetic field. MASCOT also has a hopping mechanism similar to that of MINERVA-II1. Using a motor to rotate a swing-arm within the lander, MASCOT can change its attitude or jump. Since MASCOT is designed to operate in the position where the top antenna is directed upwards and the spectroscopic microscope faces downwards, this hopping mechanism can correct the attitude if the lander is in a different orientation once on the surface of Ryugu. MASCOT can also use the hop to move locations once; the lander does not hop multiple times like the MINERVA-II1 rovers. 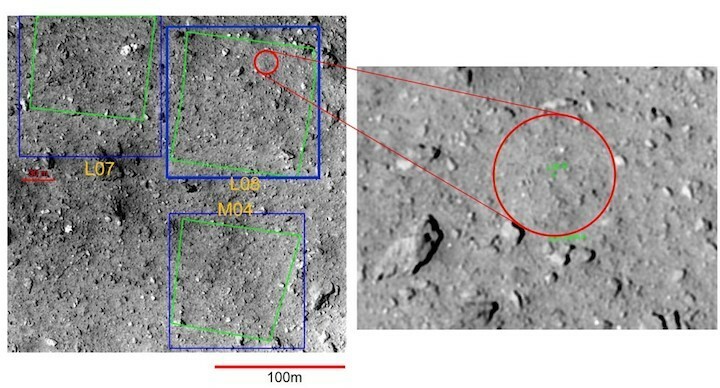 For the landing site for MASCOT, a region in the southern hemisphere of Ryugu was selected (Figure 4). 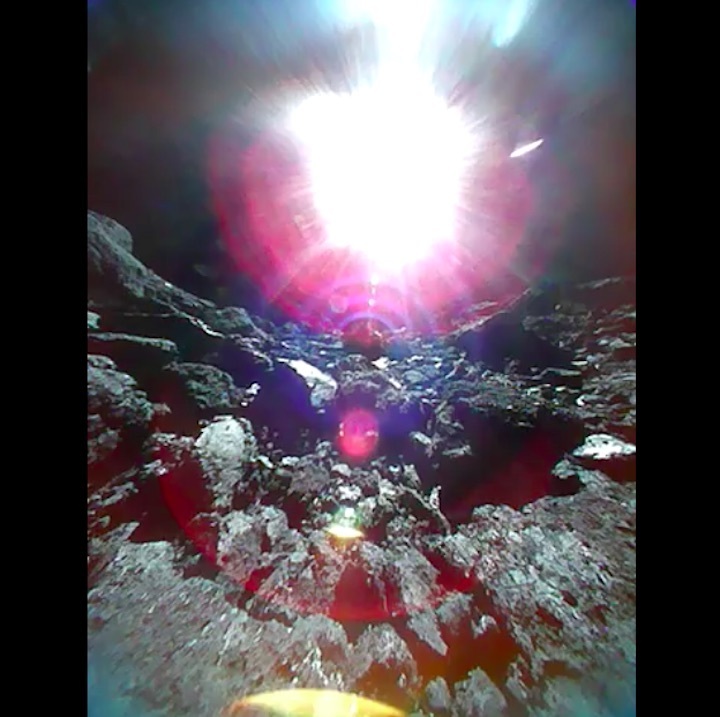 This location was selected based on criteria that ensured no overlap between the landing sites for the touchdown of Hayabusa2, MINERVA-II1 and MASCOT, the time to be able to communicate with Hayabusa2, the duration of sunlight exposure and expectation of scientifically meaningful exploration. Figure 4: MASCOT landing site candidate region (light blue area). Since MASCOT is expected to bounce several times after first touching down, a reasonably wide region is selected. (Image credit: JAXA, University of Tokyo, Kochi University, Rikkyo University, Nagoya University, Chiba Institute of Technology, Meiji University, University of Aizu, AIST, CNES, DLR). MASCOT does not use solar cells but is equipped with a lithium primary battery built into the lander. 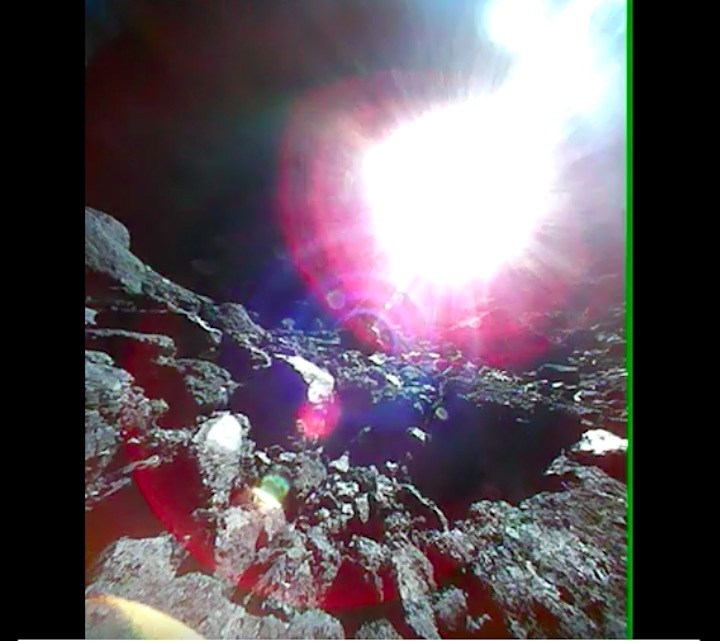 The duration of the battery is about 16 hours (about two rotations of Ryugu), allowing MASCOT to operate continuously for two Ryugu days after a successful separation. Operation of the lander will end when the battery runs out. 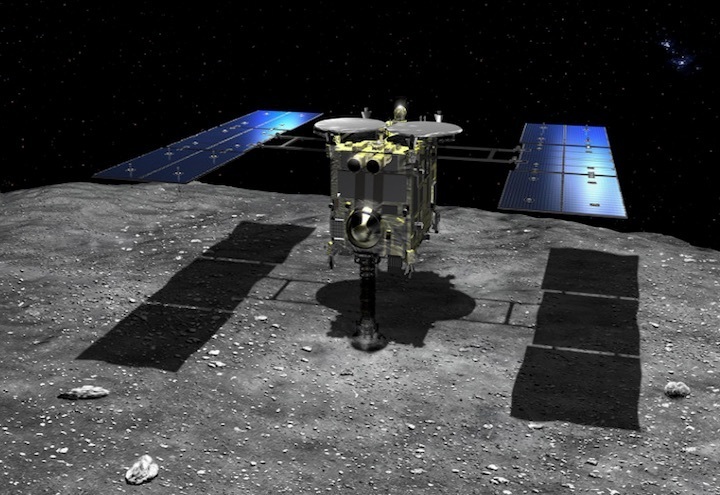 TOKYO -- The Japan Aerospace Exploration Agency (JAXA) will postpone space probe Hayabusa 2's landing on the asteroid Ryugu until January 2019, the Mainichi Shimbun has learned. JAXA will be holding a press conference shortly. 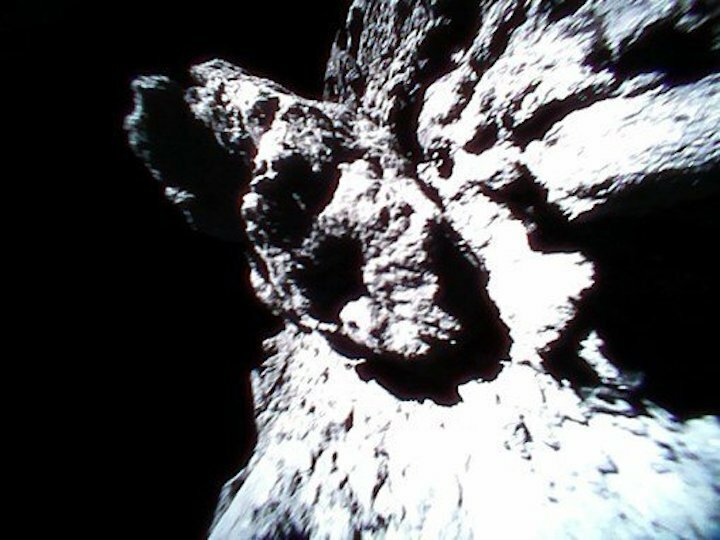 TOKYO: A Japanese probe sent to examine an asteroid in order to shed light on the origins of the solar system will now land on the rock several months later than planned, officials said Thursday (Oct 11). 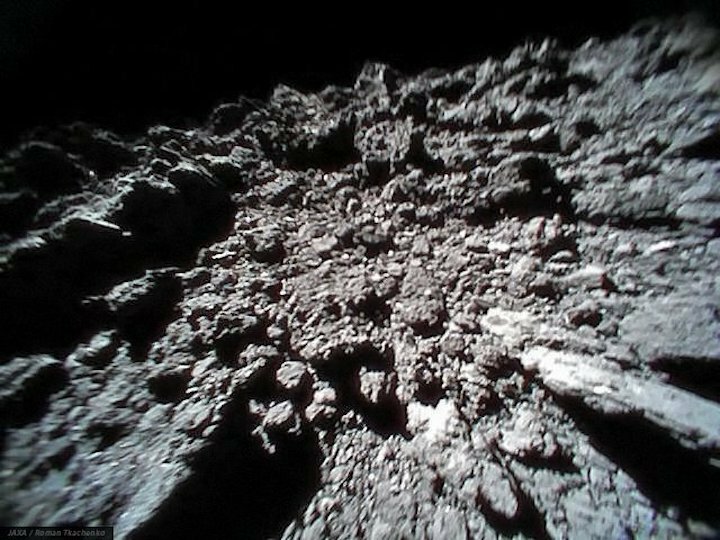 The Japan Aerospace Exploration Agency (JAXA) told reporters the Hayabusa2 probe is now expected to touch down on the Ryugu asteroid in "late January" at the earliest, rather than at the end of this month as initially expected. JAXA project manager Yuichi Tsuda said they needed more time to prepare the landing as the latest data showed the asteroid surface was more rugged than expected. "The mission ... is to land without hitting rocks," Tsuda said, adding this was a "most difficult" operation. "We had expected the surface would be smooth ... but it seems there's no flat area." 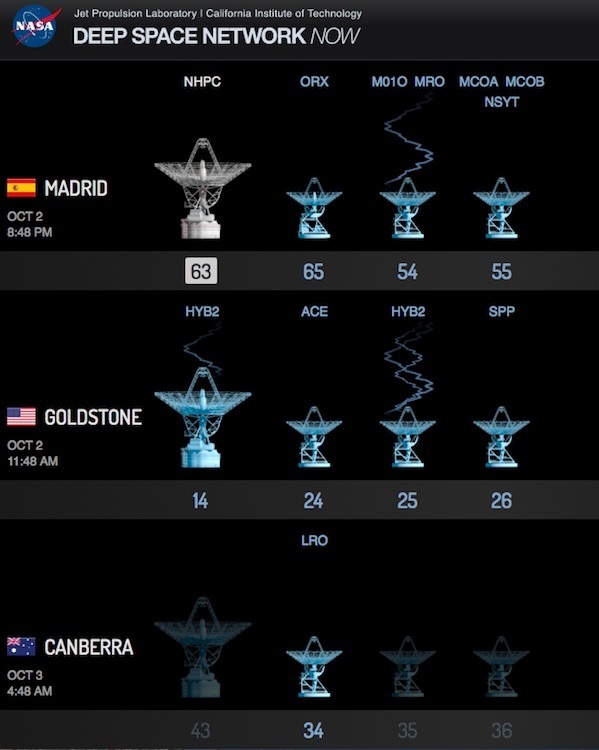 Scientists are already receiving data from other machines deployed on the surface of the asteroid. Last week, JAXA successfully landed a new 10kg observation robot known as MASCOT - "Mobile Asteroid Surface Scout." 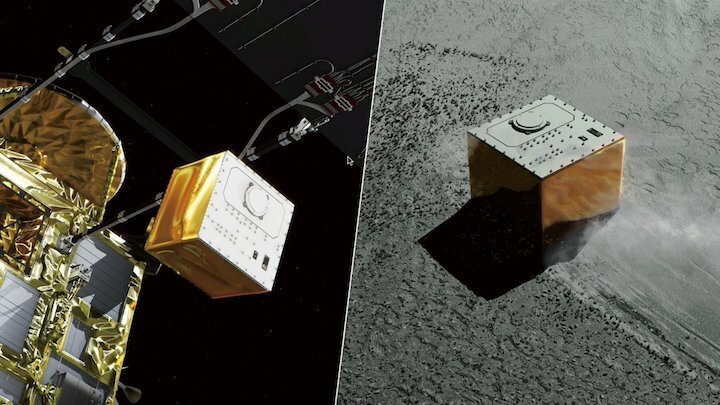 Ten days earlier, a pair of MINERVA-II micro-rovers were dropped onto the asteroid - marking the first time that moving, robotic observation devices have been successfully deployed. 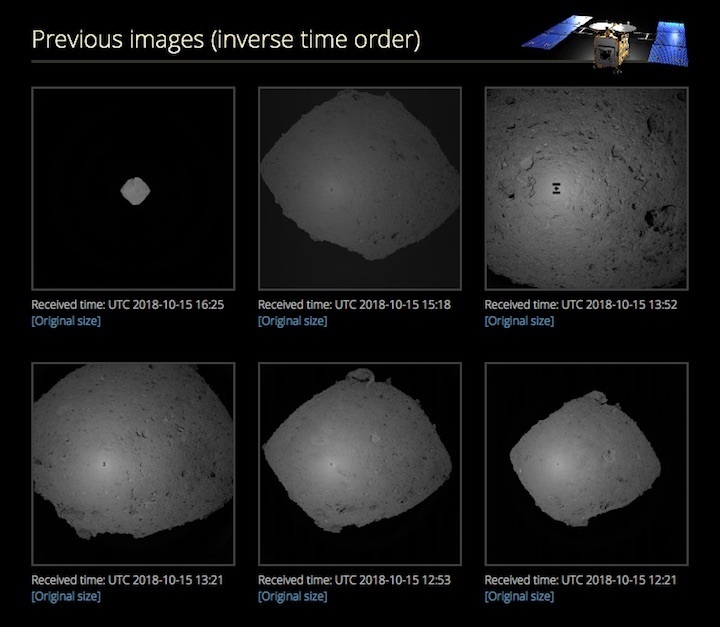 These rovers are taking advantage of Ryugu's low gravity to jump around on the surface - travelling as far as 15m and staying above the surface for as long as 15 minutes - to survey the asteroid's physical features with cameras and sensors. That probe returned from a smaller, potato-shaped, asteroid with dust samples in 2010, despite various setbacks, during an epic seven-year odyssey hailed as a scientific triumph. The Hayabusa2 mission, which costs around 30 billion yen (US$260 million), was launched in December 2014 and will return to Earth with its samples in 2020. By collecting samples from the surface, scientists hope to answer some fundamental questions about life and the universe, including whether elements from space helped give rise to life on Earth. 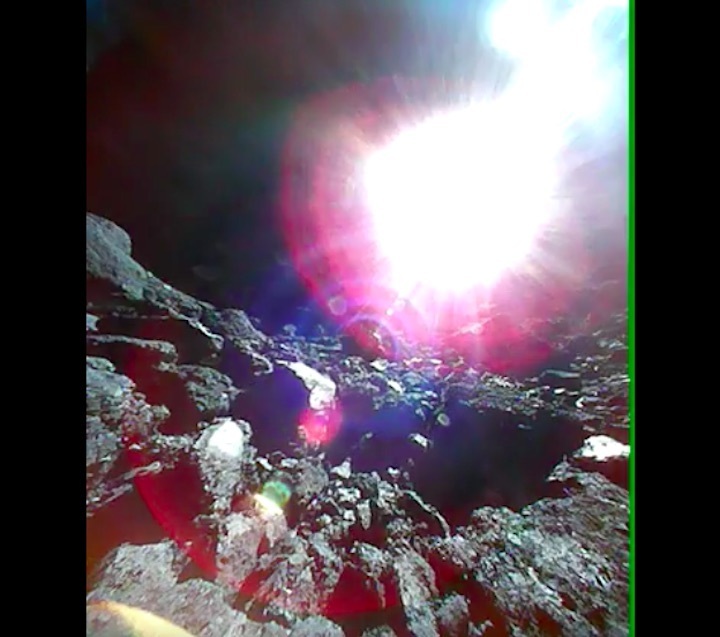 The German lander MASCOT has completed its first scientific "stroll" across the asteroid Ryugu. On the basis of the recent observations and operations in the vicinity of asteroid Ryugu by the Hayabusa2 spacecraft, the project team have decided to postpone the touchdown (TD) from the end of October this year (2018) to after January next year. 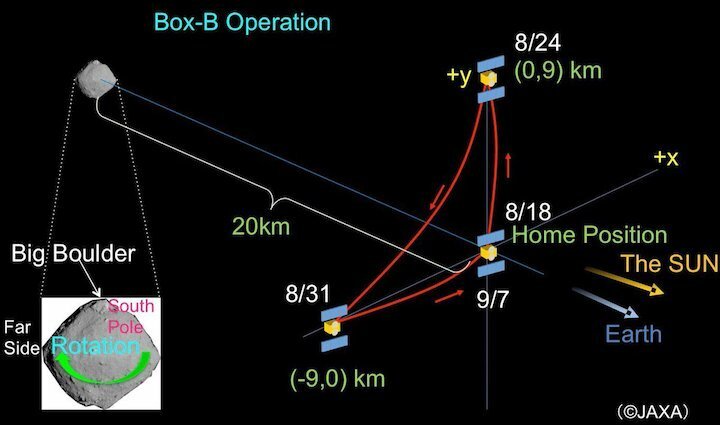 The exact timing of the first touchdown will be considered during the operation period of solar conjunction, based on the results found during the rehearsal operations up to TD1-R3. 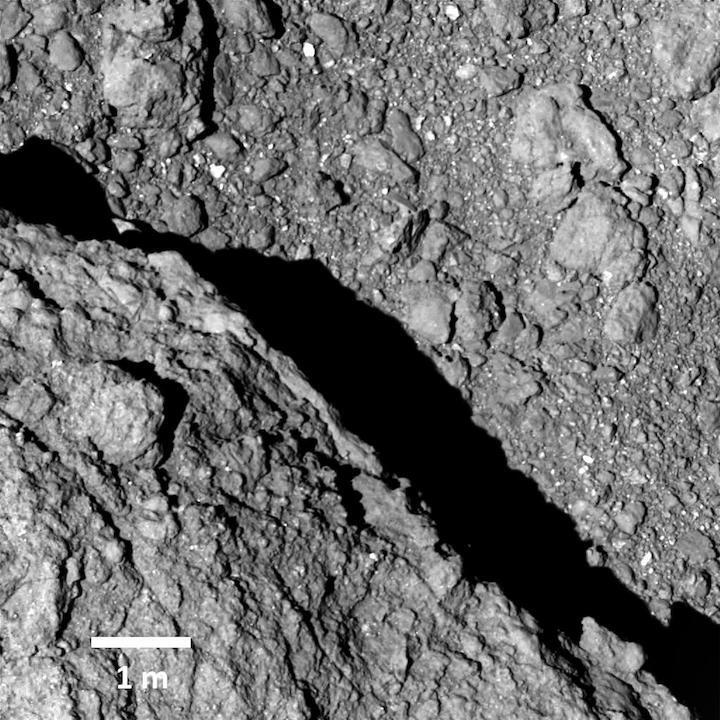 As we discovered upon arrival at the asteroid, the surface of Ryugu is covered with numerous boulders with no wide, flat areas. The landing candidate sites of L08, L07 and M04 were therefore selected as locations offering a relatively safe region for touchdown on this difficult surface. Further examination of these candidate sites revealed that based on the data so far, a section of L08 seemed to be the best spot. The project team named this area L08-B (Figure 1). Figure 1: Touchdown candidate sites L08, L07 and M04 (left). The red circle is the region named L08-B. 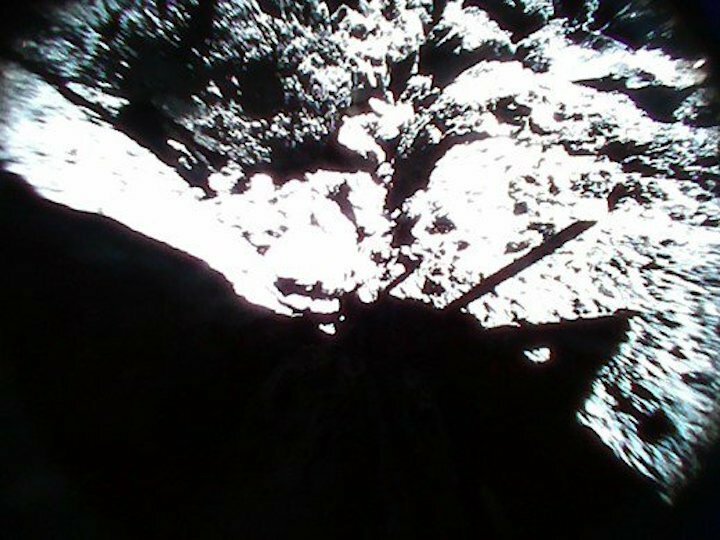 This image was captured by the ONC-T (Optical Navigation Camera – Telescopic) from an altitude of about 3km on September 12, 2018 during the Touchdown 1 Rehearsal 1 (TD1-R1) operation. In the area where the spacecraft will touchdown, it is dangerous to have boulders with a height greater than about 50cm. Since the length of the sampler horn is about 1m and the spacecraft will be to be slightly inclined during the touchdown, there is a possibility that if a boulder with a height above about 50cm is present, it will strike the main body of the spacecraft or the solar panels. Viewed from the position in Figure 2, there is no boulder larger than 50cm in the area L08-B. L08-B is the widest part within all the candidate sites without a boulder larger than 50cm. The difficulty is that area L08-B is only about 20m in diameter. Originally, it was assumed that a safe region for touchdown would be a flat area with a radius of about 50m (100m in diameter). This has now become a radius of just 10m; a fairly severe constraint. 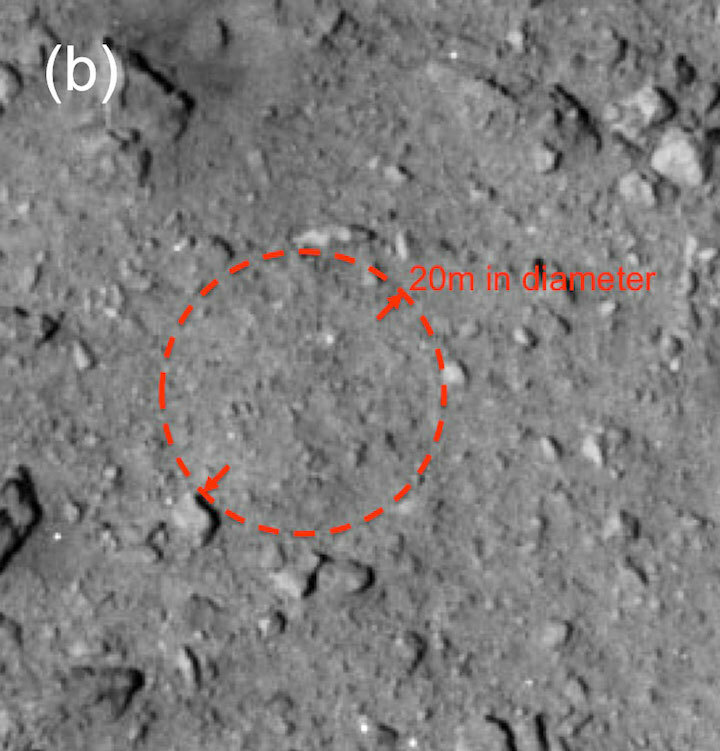 On the other hand, during the descent to an altitude of about 50m during the MINERVA-II1 and MASCOT separation operations, we were able to confirm that the spacecraft can be guided within a position accuracy of about 10m for a height 50m above the surface of Ryugu (Figure 3). This is a promising feature for touchdown. 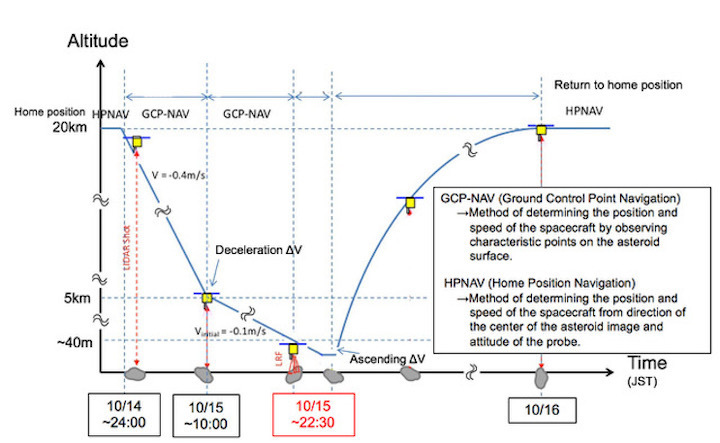 Although the spacecraft can be controlled with a position error of 10m at an altitude down to 50m, there remains the question of whether this accuracy can be retained as the spacecraft descends to the surface. This must be confirmed before touchdown operations. Therefore, the touchdown itself will be postponed until next year, during which time we will have two touchdown rehearsals; TD1-R1-A and TD1-R3. The rehearsals are designed to check the accuracy of navigation guidance at altitudes less than 50m. For this check, the characteristics of the LRF (Laser Range Finger: used to measure the altitude in near distance) need to be tested. Originally, this was planned for the first touchdown rehearsal (TD1-R1: September 10 – 12, 2018). However, during this operation the LIDAR (laser altimeter) had an issue that the mode did not changed from the far mode to the near mode and the operation of the LRF could not be confirmed. The LIDAR was confirmed to have no issue in subsequent operations, leaving only the LRF to be tested. This will be performed with TD1-R1-A. In TD1-R3, the item check list will depend on the results of TD1-R1-A. If TD1-R1-A has successfully confirmed the characteristics of the LRF, then the measurement results from the LRF will be used during control of the TD1-R3 operation and if possible, a target marker (TM) will be separated and the spacecraft confirmed to be able to properly track the target marker. The results of these operations will be investigated in detail to plan the first touchdown. Furthermore, data from the surface of Ryugu taken by the MINERVA-II1 rovers and MASCOT lander will also provide important information for the touchdown. 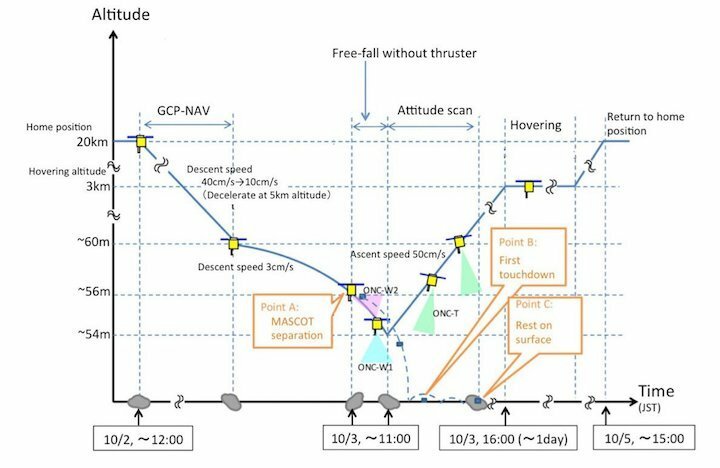 Although the first touchdown schedule is changed, we have enough time margins in our schedule, and our aim is a more reliable and safe operation through a comprehensive study of all the sources of information obtained so far during the Hayabusa2 project. The second touchdown rehearsal will be performed from October 14 – 16. The purpose of this rehearsal is to confirm the operation characteristics of the LRF (Laser Range Finder) which performs the altitude measurement at short distances. To test this, the spacecraft will descend to an altitude of about 25m. This will be the lowest altitude reached to date. The first touchdown rehearsal (TD1-R1) was conducted between September 10 – 12. During this operation, problems occurred with the distance measurement taken with the LIDAR (laser altimeter) once the spacecraft had descended to about 600m. This caused the spacecraft to rise autonomously. The issue was addressed by adjusting the settings on the laser altimeter and it was confirmed that there were no further issues during the subsequent separation operations of MINERVA-II1 and MASCOT. As the spacecraft was only able to descend to an altitude of 600m during TD-R1, the LRF characteristics could not be verified. Therefore, we are performing this check with this rehearsal. Although this is the second time a rehearsal operation has been performed, the name is TD1-R1-A as it is re-starting the challenge of TD1-R1. Time: Approximate schedule time (in 10 minute increments). There is a possibility that this may change during operation. The time is the onboard time, so confirmation of the event is the radiowave propagation time of about 18 minutes later. HP altitude: Distance to the center of Ryugu. Near point altitude: Distance to the surface of Ryugu.